In the 90’s, I was in a number of ambient projects on the Silent Records label: Thessalonians, Spice Barons, the original Astralfish - primarily as a synth player. I was also a founding member of Melting Euphoria and was on their first album, prior to them getting signed to Cleopatra Records. For that band, I played keys and handled poetry and vocals. A few years later, I had a solo project named "Spaceship Eyes," and signed with Cleopatra’s Hypnotic imprint. This was an experimental drum ‘n’ bass project. Live, I brought in other musicians and it was more of an ethno-ambient space rock band. Deeper into the nineties, I relaunched Spirits Burning as a space rock collective, working with musicians in the San Francisco area, including visiting musicians like Daevid Allen, Graham Clarke, and, years later, Cyrille Verdeaux. I also started connecting with musicians from around the world, like Steven Wilson, and eventually members of Hawkwind and other space rock bands. Over the last decade and a half, there have been 13 Spirits Burning studio albums, with over 230 musicians involved. Plus, I’ve continued doing other projects, like the second Astralfish (an instrumental project with Bridget Wishart, which showcases her EWI playing) and Grindlestone (a darker ambient project). In terms of something artistic: Maybe poetry. Maybe fiction. Probably both. As a keyboardist, I’d start with Jon Lord, Vangelis, and Tangerine Dream. As a vocalist, Robert Calvert, Peter Gabriel, and… Kate Bush (although I can’t sing like her on any level). Spirits Burning and Michael Moorcock An Alien Heat. This is a musical adaptation of Mike’s first Dancers at the End of Time books, with a collection of songs started by Albert Bouchard, my Grindlestone cohort Doug Erickson, or me. The plan is to do three albums to cover the entire Dancers... trilogy. So far, An Alien Heat includes Al, Doug, and me, bassists Adrian Shaw, Steve York, and Lux Vibratus, guitarists Andy Dalby, Richie Castellano, and Gregg McKella, keyboardists Cyrille Verdeaux and Harvey Bainbridge, violinists Jonathan Segel and Craig Fry, drummers Ken Pustelnik and Jack Gold-Molina, along with the Damned’s Monty Oxymoron on percussion. Jason Atoms does vocals on the opening tracks. Al sings one song and brought in Don Fleming for another. I really hope that I haven’t forgotten anyone. Otherwise, there are more invites in place, and I’m planning on doing a session with Mike early next year. I’m also working on multiple instrumental Spirits Burning albums. A musical adventure with mystery. If we’re talking about Spirits Burning, I tend to alternate between instrumental and vocal albums. All the albums have a bit of space rock, prog, tinges of jazz and folk, new wave, and ambient. I’d like to think that there are still experimental elements within this pluralistic construct. Plus, a surprise or two along the way, whether it’s an unexpected grouping of musicians, or styles. I guess one surprise the last few years is that I’ve started to add a bit of groove, or sense of 60s soundtracks. I am also involved in a number of ambient and instrumental projects. These include Astralfish, Grindlestone, and Spice Barons. Plenty. To name a few for Spirits Burning, I’ve always wanted to work with Arthur Brown on vocals, David Jackson on sax, Guy Evans on drums, and Paul Rudolph on guitar or bass. Sometimes there are musicians that I don’t think about until a song expresses a need. This happened with The Roadmap in Your Head album, where I knew I needed a sax on the “Coffee for Coltrane” piece, and then Cyrille suggested adding more wind and reed players on other songs. That led me down a path to reach out and connect with Theo Travis for “Coffee,” and then Gong’s Ian East, Paul Booth (who Ian recommended), and David Newhouse (who played with Paul Sears in the Muffins, and was an old friend of my cousins). It’s a convoluted package. I’m in the process, or planning stages, of re-releasing the first decade of Spirits Burning albums on Noh Poetry Records as downloads, and streaming is something that I need to consider. Do I create a non-presence on places like YouTube, or do I make sure I’m there and can be noticed? Free streaming of music (and if you stretch it, illegal downloads), can be a marketing tool if and when it leads to actual sales. Streaming does pay, albeit miniscule amounts. Help? Hindrance? I would say it’s a reality, and makes being a musician additionally challenging. In 2017, Spirits Burning will be playing a live show at a U.K. festival and I don’t mind if people record it. I really like bands that support their fans' interest in sharing recorded shows. I try to be positive, patient, and supportive of people, so having an arch nemesis is not usually part of the world I live in. If there is anyone out there feeling like they are an arch nemesis, I wish them the best, and hope they find their way to a better light in the nearest of futures. I suspect I would answer this question differently every ten minutes. In the here and now, I’ll go with one that would primarily bring together musicians no longer with us, which in and of itself would make it a special event… Jimi Hendrix, Tommy Bolin, Phil Lynott, Jon Lord, Robert Calvert for a couple of pieces, and one living person, Guy Evans. If they give each other room, and do a bit of ebb and flow, the sound and output would be quite adventurous, mysterious, spiritual. I like the idea of celebrating a type of music, say space rock, but making sure to encompass as many interpretations of what space rock is, or can be. Fill in the band and project names from there. I’ve been listening to Nick Cave’s last couple of albums. My wife Karen and I recently saw a live concert of his on TV, and went to see the “Once More with Feeling” movie at a local theatre. I’ve been following up on that. I have also been listening to songs from Game of Thrones. I suspect that going to the 2017 Game of Thrones live concert is in my future. I’ve gotten into a bad habit of starting some books, and then stopping. My current excuse is that I’m reading and rereading An Alien Heat, to better decipher sounds and approaches to the songs we are working on. Plus, I’m creating lyrics for one song, bringing together Mike’s text from two chapters… where one of the dancers from the future arrives in 19th century England. Black Sabbath. It’s been a great couple of years in the states, as lots of British bands have made their way here. Everyone from Steven Wilson, The Damned, Sting and Peter Gabriel, Steeleye Span, King Crimson, and Magma (well, they’re not British). Jesus would be interesting, if he showed up. I’d like to get his thoughts on his legacy. I’d probably give him a copy of Michael Moorcock’s Behold the Man as a dinner gift. Actually, that probably should be a prerequisite, for him to read prior to dinner. Otherwise, I’d love to have one more dinner with my parents, who passed away a few years ago. A very long dinner. Ah, you’re not done with this line of thought. One side of me would like to introduce my parents to something that I love, but they aren’t familiar with: for example, a dinner with a great variety of Thai food. On the other hand, if I’m getting the gift of them being at this dinner, it probably makes more sense to have something that they like. So, spaghetti and meatballs, a side of gnocchis, and both hot and sweet sausage from the Schmidt’s Sausage Shop, which is available only in the Pennsylvania area where I grew up. Someone recently asked me: "Why do you do music?" Which means, why write songs, why collaborate, why have them released on CD or other medium, why bother? I gave my stock answer of the last five years or so. I like to make a mark, via music, however small that mark may be. That’s true, although it feels incomplete. I thought about my answer a bit over the ensuing days, and came up with additional thoughts. I really enjoy the journey: collaborating and bringing musicians together, watching each song grow from a seed into something more, and listening. Especially those moments when you have headphones on and just bop around with the music, or turn out the lights and chill, and maybe feel a wash of emotion, whether it’s a moment of joy, sadness, intrigue, mystery, or something unknown. I really enjoy the destination. It is a special feeling to complete an album, and share it. Being an artist is often a statement of personal, or group hope. It is a hope that everyone who listens will experience some of the same emotions that were experienced during that journey and its destination. 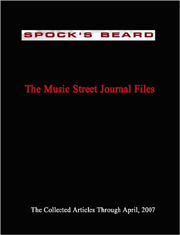 MSJ: This interview is available in book format (hardcover and paperback) in Music Street Journal: 2017 Volume 1 at lulu.com/strangesound.